Because the exterior of your home is the first thing you and your visitors see, make your home stand out by adding the architectural appeal of our board-and-batten shutters. Dramatically increase curb appeal with our inexpensive assortment of rustic cedar shutters. With a variety of styles to choose from, including joined boards, spaced boards, framed boards, and even the popular Z-Bar shutter, we are sure to have the perfect shutter for your home. 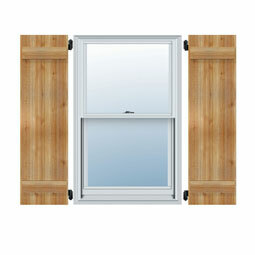 Each shutter is handcrafted in the USA by skilled craftsmen with rough planed surface texture. Our shutters can be stained or painted to match your home or quickly sanded smooth for a more refined look. Our exterior wooden shutters offer a truly distinctive look and can be ordered in a style that compliments any home. With installation taking only minutes, enhancing your home with these shutters is an easy and affordable way to improve curb appeal and extend your personal style to the outside.